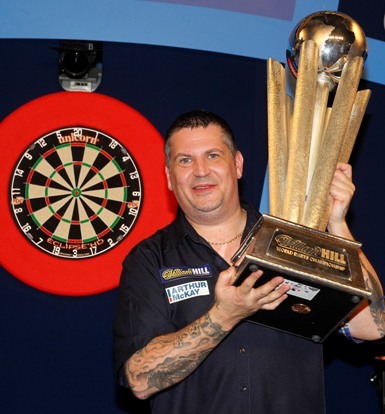 Gary Anderson will start his bid for a third World Championship crown against a preliminary round winner in London. But the Team Unicorn superstar, pictured with the 2016 trophy, has been handed a tough start against either Canadian Jeff Smith - a former Lakeside finalist - or Luke Humphries who won the 2017 PDC Unicorn Development Tour. Gary is currently having treatment on the back strain he suffered at the Grand Slam. The World Championship draw was made on Monday night by PDC Chairman Barry Hearn and Sky Sports pundit Wayne Mardle. And what an opportunity for Team Unicorn youngster Chris Dobey. He has been given the opportunity to be the last man to beat Phil Taylor at a World Championship. Taylor of course retires from professional darts after the Ally Pally and Dobey could write his name into the history books. There is a big all-Unicorn 1st Round clash between James Wade and Keegan Brown and what an experience it will be for Unicorn youngster Ted Evetts! 'Super Ted' brilliantly won the PDPA World Championship qualifier on Monday as he beat Brendan Dolan 5-1 in the final. Evetts' reward is a clash against Welshman Gerwyn Price who is yet to win a match at the Ally Pally! It was a superb performance from 'Super Ted' to earn his spot at the Alexandra Palace. Evetts, pictured below, blew away the field at Milton Keynes on Monday with some incredible darts. From a field of 144 players, he emerged victorious to earn a spot in that 1st Round and a guarantee of at least £11,000 which is the biggest pay day of his darting career. He won seven matches to make the Ally Pally. The Unicorn youngster saw off Darren Brown (5-1), Robbie Green (5-3), Ian Moss (5-3) and Luke Woodhouse (5-3). Then came a 5-3 triumph over Jeffrey de Graaf in the quarter-finals, followed by a 5-3 win over Chris Quantock in the semi-finals. 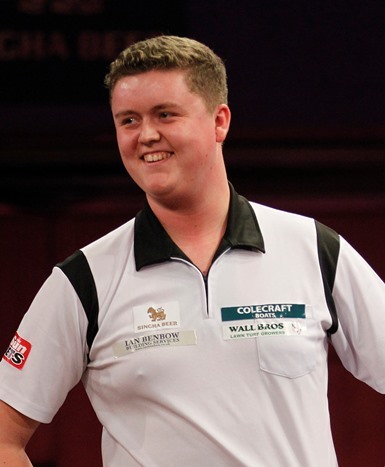 Evetts was far too good for Dolan as he beat the Northern Irishman 5-1. So what about the rest of Team Unicorn in the World Championship draw? Newly crowned PDC Unicorn World Youth Champion Dimitri van den Bergh features in one of the top ties of the 1st Round against Stephen Bunting. Joe Cullen faces Dutchman Jermaine Wattimena....Kyle Anderson plays Peter Jacques....Michael Smith faces Steve Lennon, while Ronny Huybrechts takes on World No.4 Daryl Gurney. Brother Kim meets James Richardson, Devon Petersen clashes with Darren Webster and Ian White plays the winner of the Preliminary Round clash between American William Bruguier and New Zealander Cody Harris. Elsewhere, Michael van Gerwen will start the defence of the World Championship title against fellow Dutchman Christian Kist.....Dave Chisnall takes on Vincent van der Voort, Jelle Klaasen plays Jan Dekker and Raymond van Barneveld has been drawn against Richard North. The 2018 William Hill World Darts Championship starts on December 14 at the Alexandra Palace and is 'live' on Sky Sports.